“Why did you let her bring the jigsaw? We’ll be across before she even gets the lid off.” The passengers lurched as the ferry’s chain engaged. Margaret up-ended the box so that scraps of leaves and sky and dogs fell under the table. Her father huffed and stared out of the window at the advancing shoreline while she and her mother laughed. There was another jolt so that the standing passengers clung onto each and beer and tea sloshed onto the stained carpet. For those who don’t know how Friday Fictioneers works, this picture, supplied this week by Ted Strutz is our inspiration for our weekly online writing group hosted by Rochelle Wisoff-Fields. Click here to read other people’s amazing stories or to join in. And please comment below with any suggestions for improvement on mine. AnElephant likes the fact that this story, like the ferry, can go pretty much anywhere! I (and it) might just do that. Thanks. The puzzle must suddenly seem like a pretty good idea. I’m not sure Dad will ever see it like that. I love it when a plan comes together. Sometimes it pays to be prepared. elightful story for the crossing. Thanks. Well there is that ubiquitous jigsaw puzzle again, a puzzle to me. 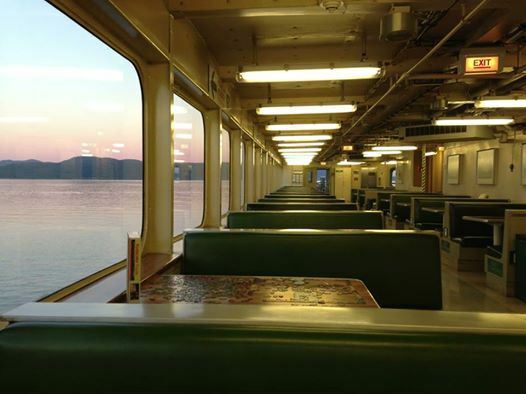 Your story is quite charming, I just want somebody to tell me if this is a uniquely American occupation while on Ferry boats…. the jigsaw was a good idea after all 🙂 i like that we can draw so many conclusions from this piece, so many frightening and interesting possibilities about the journey and the destination. Thanks KZ. I’m going to write some more today and see where that ferry takes me. Well good thing Mom was a thinking or Dad really would have been huffing and puffing chasing a toddler around the ferry. Great story. Oh, I had her as about eleven. It’s interesting how people see things differently if you don’t give all the information. Thanks for reading and commenting. That’s interesting. I suspect an eleven year old would cause other issues. This is a wonderful story in the sense that it tells so much more of the relationship in the little family… hopefully the father gets back from estrangement during the delay. I’m glad you picked up on that. That’s exactly what I was going for. Thanks Helen. I think the tension may rise, now that the chain is stuck. He was puzzled for a moment, but it probably worked out for the best. Ta Dah! Thanks for reading. I’ve been on my share of delayed ferries… and love doing puzzles. Oh to have the time to just sit on a ferry and do that. Such a lovely idea! It would be rather nice wouldn’t it? I used to do loads of puzzles when I was young; more time then. We keep one going on the dining room table, except around the holidays. Then we can all gather and do it together. A perfect example of being prepared for all eventualities. I love the way your stories tell us so much about the personalities and relationship involved, even in so few words. Well done Clare. When it comes to keeping children occupied, Dad should always defer to Mom. I love the way this came together. Concise and perfectly told in few words. Good job. Thanks Rochelle, and for your time – going round to see each writer. Much appreciated. Loved the description of the puzzle pieces! Thanks Ted, and for the inspirational picture. Was it your puzzle? Good slice of family life. Is it the dropped ‘scraps of leaves and sky and dogs’ causing the clogging problem with the chain? ‘Leaves on the chain’ do you mean? Quite possibly. Some good writing here. I enjoyed this.